While academic librarians frequently discuss critical thinking and its relationship to information literacy, the literature does not contain an abundance of sources on the topic. 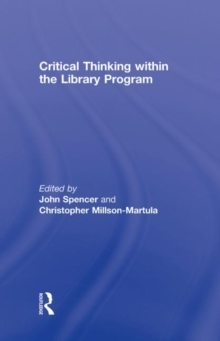 Therefore, this works provides a current and timely perspective on the possible roles of critical thinking within the library program. The work contains a variety of approaches likely to benefit the practicing librarian. It begins with a review of the literature, followed by theoretical approaches involving constructivism and the Socratic method. Readers will find pieces on the integration of critical thinking into the first-year experience and course-specific case studies, as well as a selection on a campus-wide critical thinking project. In each of the pieces, librarians are exploring new ways to meet their instructional goals, including the goal of teaching critical thinking skills to students across the curriculum. This book was originally published as a special issue of College & Undergraduate Libraries.